This is my Roll 13 for the 2016 52 Rolls project. The roll had shots from the Duncan area, and Victoria and this post has the Duncan shots. You will find others from this roll on Burnt Embers over the next few weeks, including yesterday and the day before. In February I made a trip up island to Duncan and the Lake Cowichan area. This film has waited for a scan since then so it is out of sequence. Vancouver Island is a big place at 460km long as the raven flies. A real trip up island, to the other end from Victoria where I am, is a solid eight-hour drive, and that is not even the north tip. A trip to Duncan at just over an hour is barely up island, commuting distance for some. Wait – any chance you were around back when you made this one? As a matter of fact I was! There was a narrow passage (see it on the left?) and I followed it from out front. I found two good shots on this around back trip so it was well worth the passage. It was double-worth the passage! Loved the series of pics on original post. The shops were very nice. The pic here makes me think of old movies set in theatres. I’ve seen so many of them I couldn’t say which one. 42 nd Street maybe? Thank you Kate. I sort of know what you mean, but I rarely watch movies (like once or twice a year, including at home) so I don’t have a good reference library in my head to dip into. I often find myself googling your comments to figure out the reference! That is not a complaint, just an explanation of my own deficiencies on the cultural side of things. 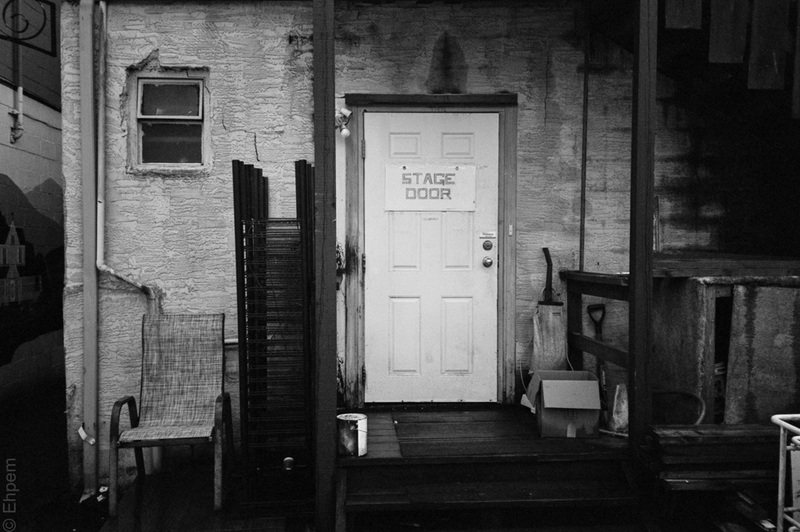 In this case, an internet search isn’t helping me, though I did find quite a few pictures of a stage door on the set of the movie (are there two movies, one old and one new, or just the old one?). I was thinking of the old one. I have never been robustly healthy so had a lot of time off school. When off sick, I used to watch two or three old movies per day on TV. In the 1970s there was a plethora of choice due to a ratings competition between two movie buff presenters. I saw a lot of the old stars in great music and dance movies. They loved to set a lot of them in vaudeville theatres. I have a lot of stage door images in my head from those films, but couldn’t attach them to any particular film. It is interesting that so many of your photos make filmic or TV connections for me, if you are not a movie buff yourself! That is interesting Kate. Perhaps it is because being a generation older than you I see the world a bit differently that is reminiscent of some of the old movies. I did watch old movies when young and some of that visual aesthetic is probably ingrained. It is so difficult to know where our influences have come from, whether artistically or musically, or even in our life choices. It is steeped in all our experiences, I guess.